Fractions and decimals are important math concepts that kids are taught soon after they master the basic mathematical operations. ‘Stir It Up’ is a fun math worksheet that tests kids’ knowledge of fractions and decimals. There are two levels of problems that kids need to address in this worksheet. 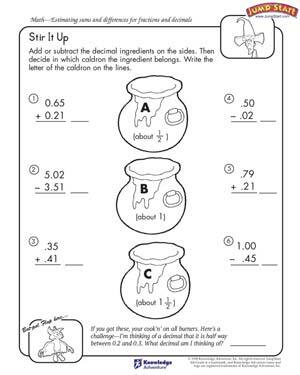 They need to add and subtract decimal numbers as well as estimate which fractions mentioned in the worksheet do the results fit under.